Doctoral researcher and consultant, she works on humanitarian and development aid, with particular attention to Africa. She is in the AFFRICA.org editorial team. Phd candidate in Anthropology, works with Spanish colonial photography in Equatorial Guinea. Her main research fields are Visual Anthropology and Visual Ethnography. Associated researcher at CRENoS – Centre for North South Economic Research (Universities of Cagliari and Sassari). His research interests are mainly tourism, migrations and development. Together with Marisa Fois, he conceived AFFRICA.org, and has been part of its editorial team. Professor of African History at the University of Cagliari. She is mainly interested on Somalia, foundation of Post-colonial State and democratization processes in Africa. 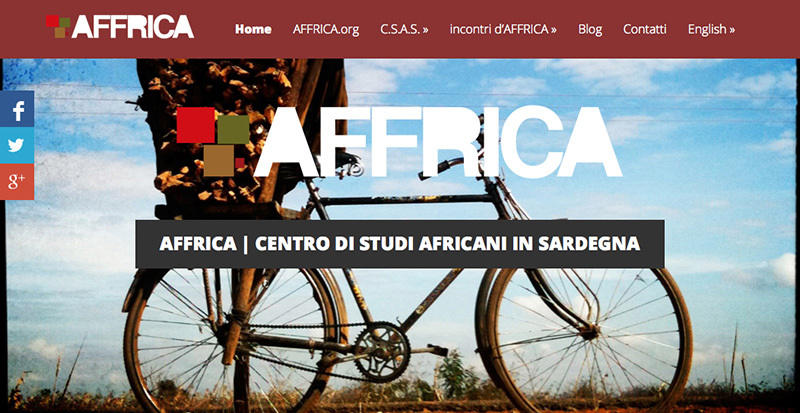 She is the founder of AFFRICA – Centro di Studi Africani in Sardegna (CSAS) and its current President. Middle East communication specialist for U.S. – based NGO IOCC and freelance journalist in Beirut. She holds a PhD in African studies with a thesis on media in South Africa. Post doctoral fellow at the University of Cagliari. She works on minorities, politics and identity in North Africa. She is the secretary of CSAS. Together with Michele Carboni, she conceived AFFRICA.org, and has been part of its editorial team. Researcher at the University of Cagliari. He is a specialist in Near Eastern and Ottoman history. Lecturer in Contemporary History at the University of Cagliari. He works on the History of Fascism and on the History of Italian colonialism. Post doctoral fellow at the University of Cagliari. He works on Jewish settlements in North Africa. He is in the AFFRICA.org editorial team. She holds a PhD in African Studies and works as a consultant. In the past few years, she has been dealing with decentralisation and with evaluation of international development projects funded by the European Commission in African countries. Professor of Geography at the University of Cagliari and research fellow at CRENoS. His main research topics are: environmental politics and local development, cultural tourism and geography of Maghreb, water and waste management in the Mediterranean region. Post doctoral fellow at the University of Cagliari. Her main research topic are refugee movements, border demarcation, and relation between religion and politics in the Great Lakes Region, with a special focus on Uganda. She is in the AFFRICA.org editorial team. Research fellow at University of Cagliari. She mainly works on Euro-Mediterranean cooperation. She is in the AFFRICA.org editorial team.